LAWRENCE — Kiel Johnson is a talented and artistic force in the contemporary art world, both as a gallery artist in New York City and Los Angeles and as a TED Talks presenter. A 1998 graduate of the University of Kansas visual art sculpture and drawing programs, Johnson will visit campus to meet with students and give a public lecture. Johnson’s visiting artist lecture will be at 1:30 p.m. Thursday, March 26, Art & Design Room 421. The lecture is free, and the public is welcome. Johnson will visit visual art classes that have direct correlation to his work, including the Art Principles & Practice class, which is working on a musical instrument project; the Build Smart sculpture class and Swindell’s Pedal-Powered Sculpture class, which uses found materials to build original “moving” sculpture that is driven by human power. Johnson is a Los Angeles-based artist currently working along the the West Coast, getting involved in any creative project that will have him. With an emphasis on drawings and sculpture, his works always say handmade, hard work and having fun. Johnson brings the inanimate to life, giving us a world not unlike ours yet entirely his. Collaboration has become a big part of his practice as well. 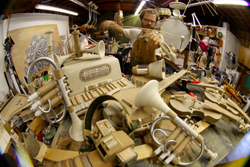 Through epic workshops, artist talks and collaborative video projects, Johnson uses simple materials and handmade ingenuity to bring the infectious disease of creativity to anyone willing to engage. His work has been exhibited widely throughout galleries and museums around the country with recent solo shows at Mark Moore Gallery, Los Angeles; Davidson Contemporary, New York; and The Taubman Museum, Roanoke, Virginia. Johnson is also the recipient of numerous awards, including the Pollock-Krasner Grant in 2008; Durfee Foundation ARC Grant in 2007; and the Outstanding Creative Achievement Award in 2003. Johnson has spoken about his work at TED events around the world, with recent talks at TEDxAlAin, United Arab Emirates, and TEDxChristchurch, New Zealand. The Art & Design Building is at the northeast corner of 15th Street and Naismith Drive. Visitor parking is available at the Allen Fieldhouse Parking Garage, 1501 Irving Hill Road.